There are many reasons why someone would want to convert a video into a GIF animation. The main one is so that people can put an animation of a video online without streaming the video itself such as on Twitter,Weibo. but for those not acquainted with the process, it can seem difficult. 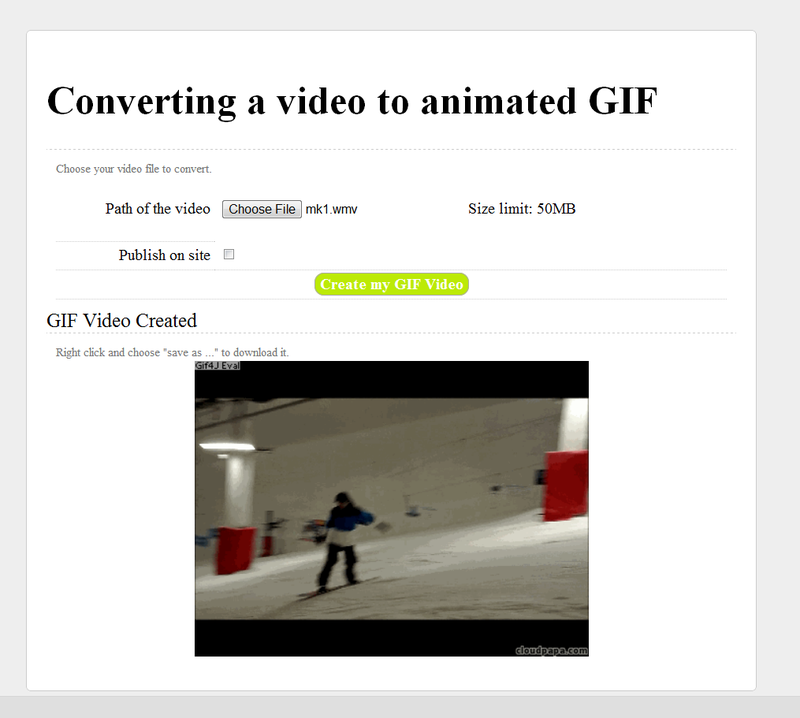 I have developed a website for online Video to Animated GIF converting service. Cloudpapa (http://www.cloudpapa.com) is a powerful online service built in the Cloud Computing environment to convert video file to animated GIF file. You can use this software to convert selected part or convert a single video file. Picture cropping, flipping are supported. You may also use it to make grayscale or sepia GIF file. It supports various popular video formats, such as avi, mp4, wmv, asf, mpg, dat, 3gp, flv, f4v, mov, mkv, rm, rmvb, swf, vob, webm. The interface is very user-friendly and easy-to-use. Main supported video formats: 3GPP files (*.3gp,*.3g2,*.3gpp;*,3g,*.k3g,*,3gp2); AMV files (*.amv); AVI Files (*.avi); Digital Video Files (*.dv); DVD Video Files (*.vob); Flash Video (*.flv,*.f4v,*.swf); Matroska Video (*.mkv); MPEG Files (*.mpg, *.mpeg , *.mpe, *.m1v, *.m2v, *.m2t, *.tod); MPEG-4 files(*.mp4,*.m4v); NDS DPG Files (*.dpg); QuickTime Files (*.mov,*.qt); RealMedia file (*.rm,*.rmvb); VCD Movie Files (*.dat); WebM Video Files (*.webm); Windows Media Video Files (*.wmv,*.asf). Which one actually is the world thinnest laptop?